Sun Tzu’s “Art of War” was probably written around 400 B.C. in China. Almost two and a half thousand years have passed since the treatise was composed and it has travelled through the hands of more than a hundred generations without losing its appeal. There are people involved in the business of war who consider that teachings of Sun Tzu are valid even today. There is an intrinsic relation between technology and war. One probably drives the other. Wars have pushed technology to advance and at the same time advanced technology has also pushed people towards war. 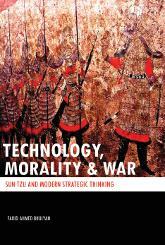 When change is the unchangeable characteristic of technology and has an intrinsic relation with war, how a book on the art of war, written almost two and half thousand years back, remained relevant? Sun Tzu’s, “Art of War” is the product of a culture and time where philosophical sensibilities were considered crucial in warfare. It is this reflection of positive attitude in its teachings which has kept the treatise valid even today. “All warfare is based on deception”, this famous aphorism of Sun Tzu had a critical impact on some of the Western scholars. They claim that this attitude reflects the traditional dependence on rues and stratagem and the abandonment of a strict code of chivalry during the Warring States period (453 – 221 B.C.). According to them, Sun Tzu’s mystical, metaphysical views was conveyed by his text betray the close connection of military thought with the philosophical schools of Confucianism, Taoism, and Legalism. People brought up in the Western traditions, are likely to make such mistakes in comprehending the spirit of Sun Tzu’s teachings. In fact, with utterances like, the Chinese traditions of warfare are indirect and stratagem oriented and the Western traditions of warfare are direct and based on a code of chivalry, one is liable to make a mistake. Such a statement undermines the spirit of the Chinese code of chivalry. Making Sun Tzu only responsible for the betrayal of the moral ways of Confucius and Lao Tzu and pioneering the Chinese way of Stratagem dependent indirect approach by abandoning a strict code of chivalry is incorrect. Students of international relations, strategic studies, war studies, security studies, political science, military history and philosophy of war will find this book interesting and useful.